Entrepreneurship, sustainable food systems, traditional food production, and alternative concepts are something that we are confronted with basically every day within our studies. Now, we want to see what the real world looks like. How do companies work behind the scenes and what can we find to maybe inspire others. 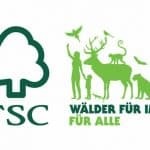 We want to focus on sustainability, company structures and of course the quality of the products. … but in the end it is not what they do, but why and how they do it. This is what is most important for us as well. For each company, the focus will lie on the most important trait of the company. Whether it is their vision, their creativity, maybe negative traits, their authenticity, originality etc. Our main goal is to raise consumer awareness. The more you know, the more freedom of choice you will get, and in the end, we are the ones who can make a change – its simple economics: our demand shapes the supply. So why Fattoria La Vialla? Every kid remembers the brands that shaped their childhood. For me and Moritz it has boxes full of straw and little Tuscan treats from Fattoria la Vialla. I often dreamed about the pictures I found in the catalogues and wondered what this place might look and feel like in real life. So when we finally had the chance to come to Tuscany we were both pretty nervous. I think consumers today are getting more suspicious about marketing. Whether it is a happy farmer with his happy cows in the advertisements of conventional milk companies, or vegetables and fruit that are just harvested from a luscious beautiful field and directly processed into your favorite jam. Consumers know that oftentimes the reality looks quite different. Food is deeply connected to our emotions and we love to paint a beautiful picture of our favorite foods. That is why we get so upset when we find out that we were consuming something produced in a way far from our visualization. 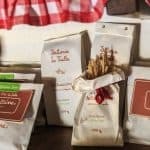 The emotional relationship with Fattoria la Vialla’s products is deep. Everything seems hand-packaged, handcrafted and handwritten just for you. 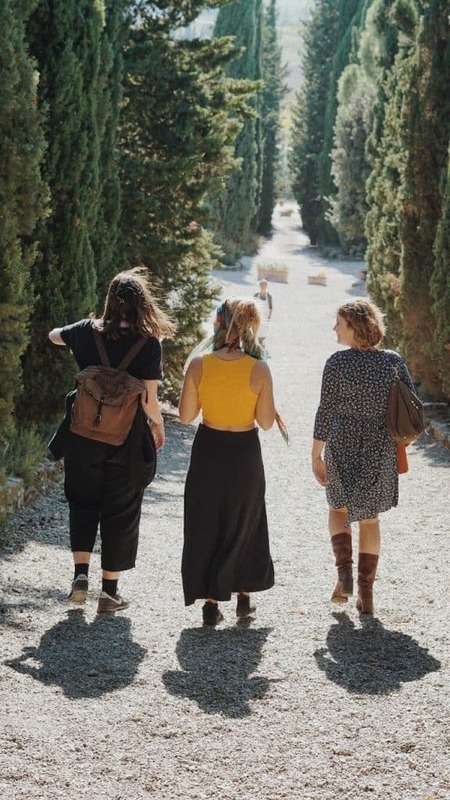 The pictures show smiling people handcrafting traditional Tuscan products, walking through vineyards, olive groves, and colorful vegetable gardens. Their promise? To be 100% biodynamic and organic, producing traditional Tuscan products with the aim of being as sustainable and high quality as possible. 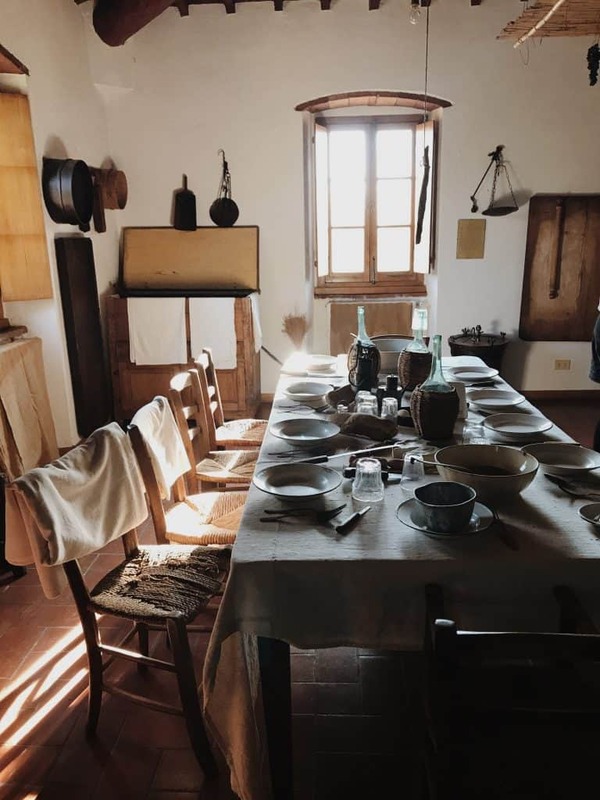 We spent a couple of days at the farm and curiously watched how our little fantasy of La Vialla was actually real. How a constantly growing family business can stay authentic, making employees, nature and consumers happy. 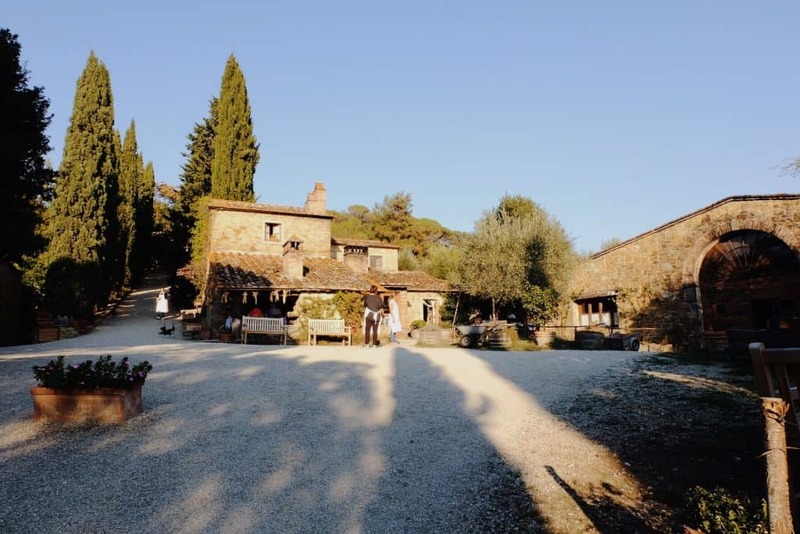 Name: Fattoria La Vialla literally means “Farm of the plow”. 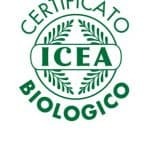 Products: Demeter certified red, white, dry, sweet & sparkling wines, extra virgin olive oil, vinegar, pecorino cheese, antipasti, cold cuts, sauces, pasta, biscuits and sweets, honey, polyphenolic supplements and biodynamic skin care products. Everything is grown and produced in-house: From the vineyard to the glass, from the vegetable patch to the jar. Available: Online, at the Farm shop in Tuscany, in Fattoria La Vialla’s “Speisekammer” in Frankfurt, Horb am Neckar and Regensburg. 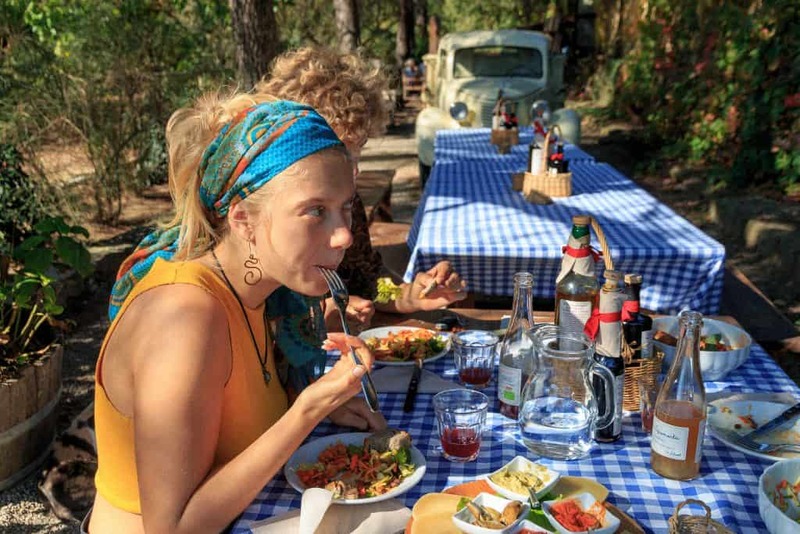 Flexible Biodynamics vs. Dogmatism: During our studies, so far, we have met a lot of biodynamic producers, who gave us a broad picture of the attitudes towards Steiner’s philosophy and varying degrees of some kind of dogmatism. If you ever do research on the history of biodynamics, Steiner’s other writings and more or less unconventional approaches, you may come across very exact descriptions of how, and especially when, agricultural practices should be done. 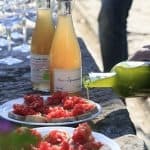 While at la Vialla it became clear “not every biodynamic farm follows everything in a dogmatic way and not every biodynamic practitioner is an anthroposophist. Although biodynamics follows an exact plan of agricultural practices according to the moon and movement of planets, trying to listen to the plants, nature and the climate, for example harvesting two-three days later than prescribed if it is for example raining. Demeter. 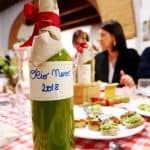 We got curious and found out that although following the exact schedule and practices that are recommended by Demeter, the biodynamic association, it is not mandatory to follow them into every detail. This allows the farmers to react to extreme weather or other conditions. This flexibility is important for la Vialla. Packaging: Only recycled paper and cardboard, FSC certified (Forest Stewardship Council). Production: Biodynamic, regional, organic, based on seasons. Transformation: The photovoltaic plant, recycling of water through phyto–purification, composting of organic waste, care of the woodland, no use of plastic, CO2 neutral production, seasonal production, biodynamic principles, inclusion of regional labour force, building up a community and a family-like working environment. C02 neutral production: In 2014, Fattoria La Vialla was certified as carbon neutral . Fattoria La Vialla started measuring its carbon footprint in 2008. Transportation: Train transportation is used as much as possible. Other transport is “Go green”. All the products are: Certified organic-biodynamic and produced in a carbon neutral, sustainable way. This product grew quite close to our hearts. 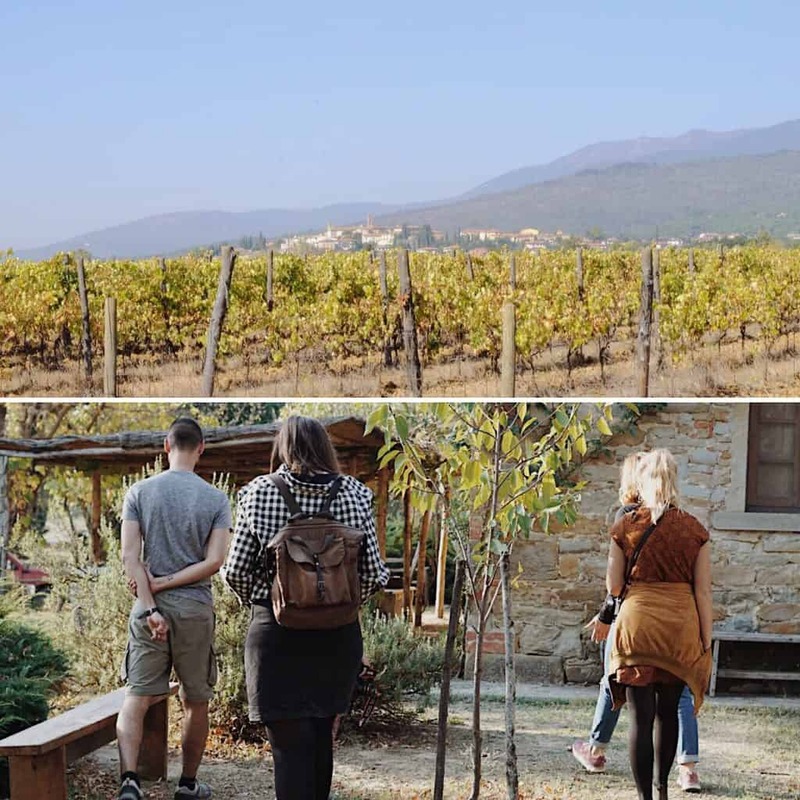 As we were visiting the Fattoria at the end of October we were able to see the whole process, from harvesting to olive oil production and also bottling. We would like to share this experience with you. How to taste: First look at it. No! Contrary to what people usually say, the colour of olive oil is not an indication of its quality. Second, place one hand on top of your glass and warm it with the other. 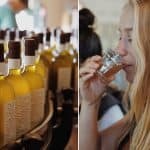 Then smell the olive oil, what aromas does it have? Third, slurp. Coat the inside of your whole mouth with the oil and observe how it behaves. Then swallow and concentrate on the flavours. Is it almost spicy? That is normal for a good, Tuscan, cold pressed extra virgin olive oil. 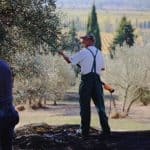 How is extra virgin olive oil made: The olives for the oil come from the 30,000 trees, of all ages, that grow on the property of the Fattoria. In order to achieve a balanced flavor profile. 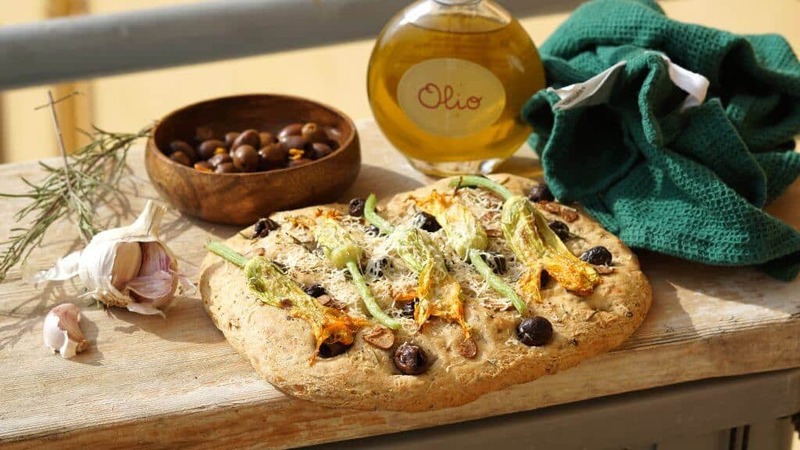 The oil is a melange of 4 varieties of olives: Frantoiane (good oil ratio 18-20% and intense fruity flavor, high polyphenols) Leccine (good oil ratio, ripen first), Raggiaie (good oil ratio, intense flavor, high polyphenols) and Morelline (the most flavorsome, with very low oil ratio). The product is an expression of the land that it has grown on. The soil, the plants, the people who took care of it, the rain, the sun … it all counts. The focus for La Vialla is to create the best olive oil every year and not to produce a standard, constant flavor. 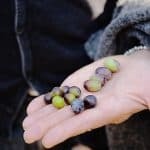 These four varieties are pressed together, while some are still unripe and therefore provide a high content of the health-beneficial polyphenols. The extra virgin olive oil is cold-pressed, meaning that during every step of the process the temperature does not exceed 27°C. We were standing in the processing area when Annette and Alceo started to explain all the production phases to us. 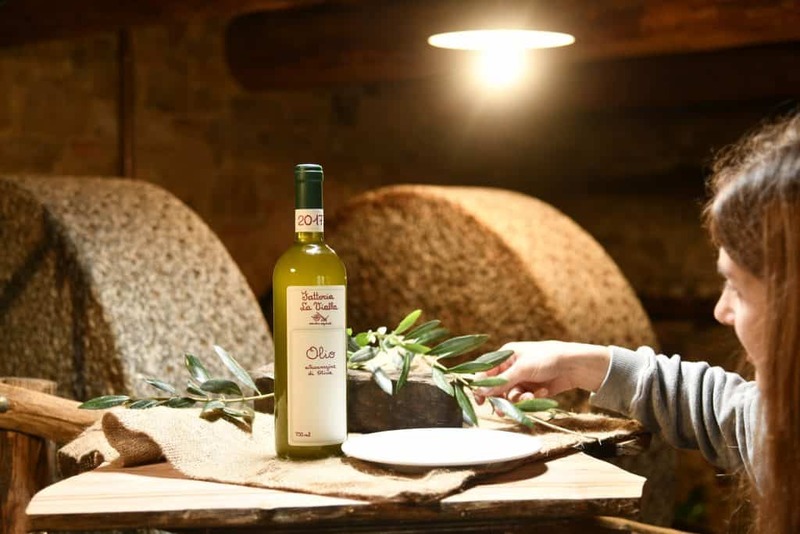 After washing, the olives are “crushed” with two gigantic stone wheels which turn until a paste is formed. This paste is then kneaded for 20-30 minutes to create an emulsion of oil and vegetation water. Then the so-called “sansa” (=remains of olive stones, skins etc.) is centrifuged out. Afterwards, the vegetation water gets separated from the olive oil by a second centrifugation. At La Vialla the whole process – from crushing to oil – occurs in a protected atmosphere. No oxygen is present during the entire milling process and therefore the best possible quality and nutritional properties are ensured. Once again La Vialla wastes nothing – all the residues of the pressing and the leaves get composted, while the vegetation water has recently been developed into a dietary supplement thanks to its exceptionally high polyphenol content (antioxidant). Taste: La Vialla’s oil has won numerous prizes for its quality and flavor. But in the end, your own taste matters the most, just like for wines. After pressing, the oil is luscious green and dense. The taste is very flavor rich, spicy and bitter due to its high polyphenol content. The bouquet unfolds its different aspects and you can get new impressions every time you taste it. Personal opinion: As it is so rich in flavor, we would only use it for things that either compliment the flavor of the olive oil or give it its space. It will definitely play a big role in every dish you use it with. From bruschetta to grilled veggies and salads. This oil gives everything its little gourmet touch. Non-filtered wines are the absolute trend right now. But what does that mean? Filtration has become a fundamental step in processing wine in the last century. It basically describes the extraction of yeast, bacteria, sediments and other bigger particles in order to achieve a microbial safe, standardized, crystal clear product. 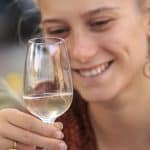 It’s safe to say that filtered wines are on the safe side when it comes to unpleasant alteration and you simply have a standardized product. On the other hand, the “non-filtering” method reduces the use of sulfites down to a minimum. So why not filter? Filtering or not filtering wines has been in a big debate lately. While there is no scientific proof found yet. Some winemakers argue with the fact that there is a higher phenolic content. Scientist Roger Corder, has written a book, “The red wine diet”, based on his studies of this issue. 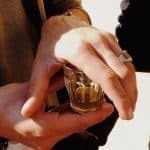 Others insist on preserving the original flavors, kind of like a Polaroid snapshot of the vintage, that otherwise get lost during the filtration process. For sure, there is an exploding demand for unfiltered wines because of their innovativeness and naturalness. Taste-wise, we found that non-filtered wines appear to have a richer mouth-feel and we simply love this one from La Vialla. 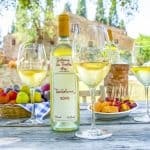 How is Torbolino made: Torbolino’s grape blend consists of Chardonnay, Viognier, Sauvignon Blanc and Traminer. 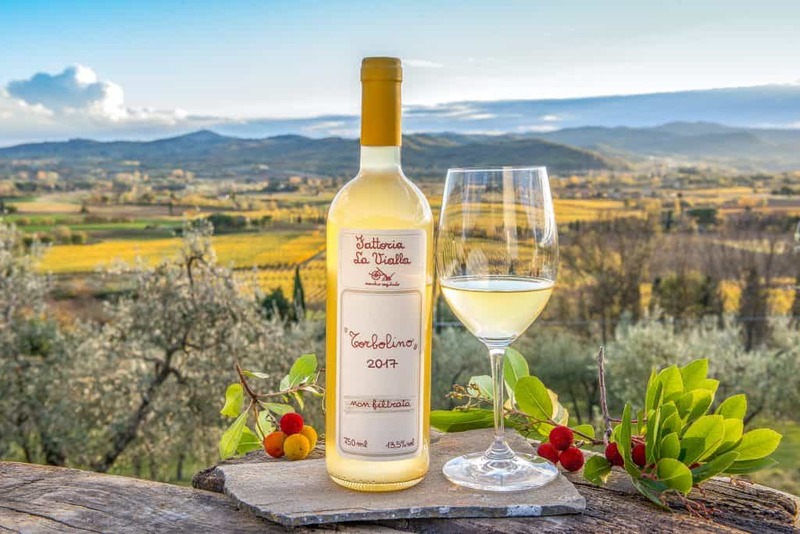 As previously described the “Torbolino non-filtrato” does not undergo the process of filtering out yeasts, sediments and small grape particles which give it its characterizing blurry look. After vinification, the wine is stored in steel tanks for up to 5 months. 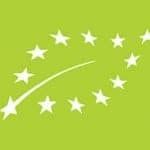 For all vegans – it’s important to say that no animal products are used to produce any of the La Vialla wines. Brief Wine Tasting: First look at the color. If you have stored the wine for a longer time, you might have to gently shake the bottle to spread the sediments. In the glass, the wine has an almost shimmery, bright-sunny warm yellow. Secondly, the smell. The nose really reminds of tropical fruits like maracuja, but also sweet lemons. Rich but also refreshing. Third, taste. The impression of the nose is also to be found in the taste. All in all the wine is very aromatic, with a good balance between freshness and acidity. It almost feels like one flavor unfolds after the other and leaves you with a full-body and a long-lasting aftertaste. Personal opinion: Personally, this was our first contact with non-filtered wines. Coming from a region which is world-wide famous for Riesling, this was definitely something new. My first impression of the wine; really fruity, smooth in the mouthfeel and refreshing. I am not sure whether I was triggered by the association that something unfiltered is healthier and richer in flavors, but it definitely was the feeling I had while tasting this wine. I always love when food and drinks have something almost magical. While turning the bottle, after a few weeks, I was amazed by the particles flowing, almost dancing through the clear yellow wine until it was fully dissolved again. This wine is natural-magic! 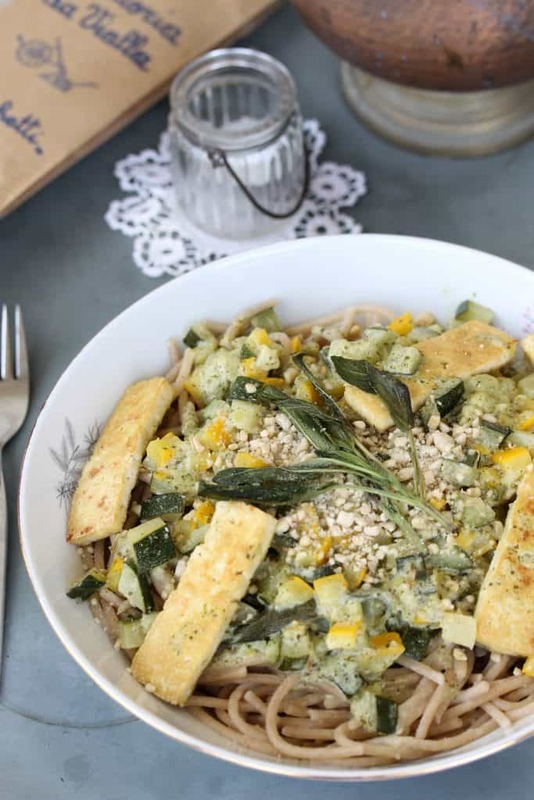 If you have clicked through our recipes or followed us for a longer time, you might know, we are big fans of wholegrain spelt pasta. Not only because it contains more fiber and satisfies us longer, but also for the taste. Both of us enjoy the almost nutty flavor of this type of pasta and have combined it with all different kinds of sauces, which compliment this characteristic. 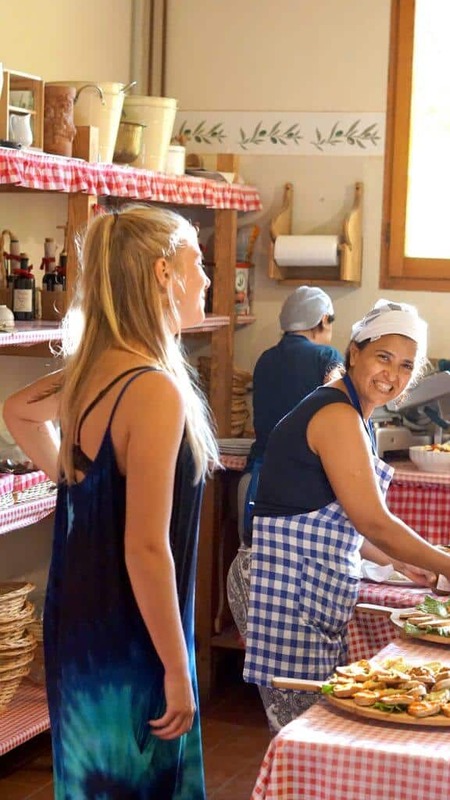 Therefore, we also chose to investigate La Vialla’s Spelt Pasta version which we are going to introduce in this part of the article. 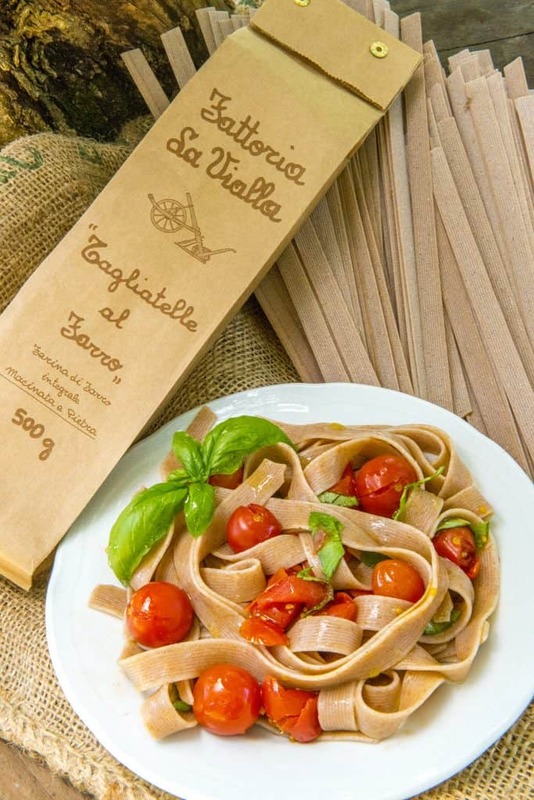 How are the Taglitelle made: These spelt Tagliatelle of La Vialla are made from stone-ground spelt flour. So what does that mean? In our studies in France, as well as here in Italy, we have come to learn the crucial effect of different milling processes. The main difference between stone-milling and industrial milling is that the stones are turning at a significantly lower rate. Thus, of course, being less productive but most of all not producing a high friction temperature. The grain, when milled as a whole, has the endosperm which is the starch-containing part, the bran with its protein and fiber, the hull which contains the fibers and the germ which is the storage of fats, protein, minerals and vitamins. Industrial milling at a high speed will increase the temperature through friction and cause the germ and the proteins to denaturate and erase the vitamins. This may also result in the production of damaged starches which are unpleasant for flavor and quality of the end-product. Therefore, stone milling is not only more traditional but also helps to preserve the nutritional and organoleptic quality of the flour. Taste: In order to get the full taste experience we paired the Tagliatelle with olive oil, garlic and pan-tossed cherry tomatoes, basil and a pinch of sea salt. The pasta remained with a good “bite” after cooking ( al dente) and the size of the Tagliatelle made them really rich and filling. Nevertheless, they had a smooth texture without recognizable bran pieces, which can be irritating in some other whole-grain pasta. Spelt wholegrain pasta often has a characteristic flavor, which was also true for these. They gave the dish a delicate nut-like undertone which can be really nice when correctly combined. Personal opinion: Rich and flavorful- that basically summed it up for us. Therefore, we would always combine it with something light, like olive oil, to appreciate the flavor they already bring on their own. Other than that, they also go well with all different kinds of tomato/vegetable sauces. Also sometimes referred to as Biscotti, which comes from the Latin word “biscoctum” meaning twice cooked. The twice baking method was developed to make these little cookies long lasting and gives them their characteristic hard texture. Traditionally, this Tuscan classic is made with almonds and dipped into Vin Santo, the regional dessert wine. Nowadays you can find Cantucci on supermarket shelves all across the world. Factories and artisan bakers have also decided to change the original recipe, adding for example chocolate, lemon, making them sweeter and softer. 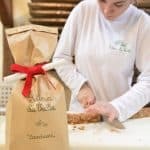 How the Cantucci are made: La Fattoria decided to stay in line with the traditional Tuscan recipe. Only a few ingredients, including whole grain and white wheat flour, cane sugar, almonds, organic eggs. First, the dough gets kneaded and formed into long rolls, placed on trays and baked in the wood- fired oven. Then the long snakes are cut into slices to make the individual “Cantucci”. 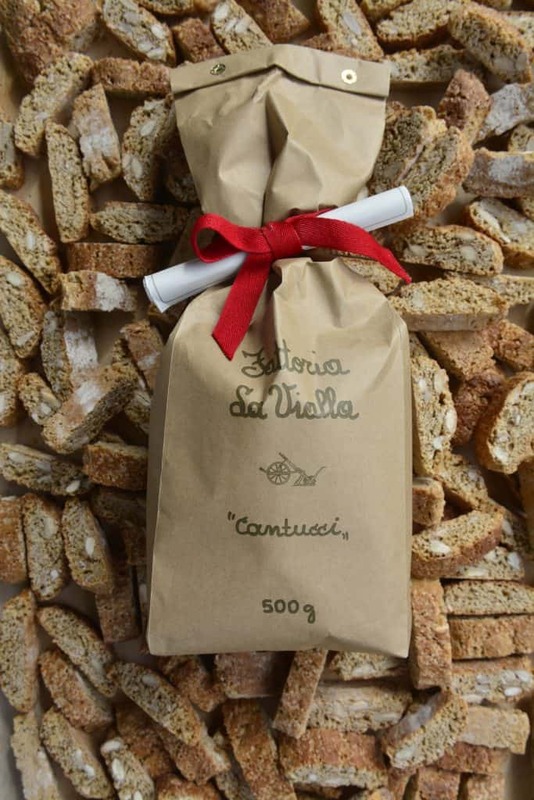 Taste: La Vialla follows the traditional rustic Tuscan recipe, the texture is quite hard and the sweetness is moderate. Due to the fact that they are not solely made out of white flour, they have a filling and satisfying effect (not like some cookies that you can’t stop eating until you feel sick). Personal Opinion: As I am personally used to the Cantucci that my grandma makes, which are normally not so hard, I was quite surprised by how hard these cookies can be. Definitely only something for people with good teeth or who like to dip their cookies into coffee or dessert wines. After starting to dip them into my coffee and simply taking my time while eating them, I definitely fell in love with them. They are the perfect example of “sometimes the most simple things are the best”. As they are so moderate in sweetness and complexity of the recipe, you can really enjoy the flavor of the flours and the combination with the almonds. And again, I love these cookies for their satisfying effect. Sometimes I get frustrated by the addictiveness of sugary treats, which in the end just make me have a sugar rush and a bad feeling in my stomach. 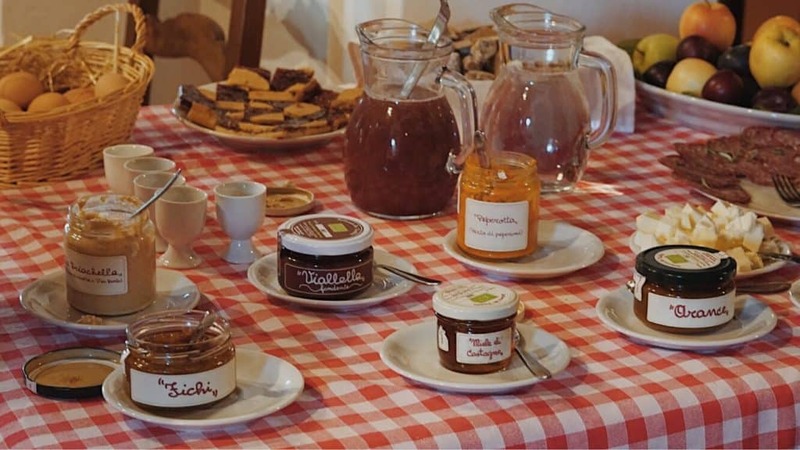 Last but not least, we want to introduce you to one of the famous sauces of Fattoria la Vialla. 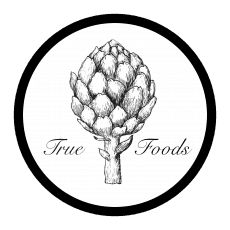 It is 100% vegan, as well as free from allergens, and is also one of our favorite products of the Fattoria. 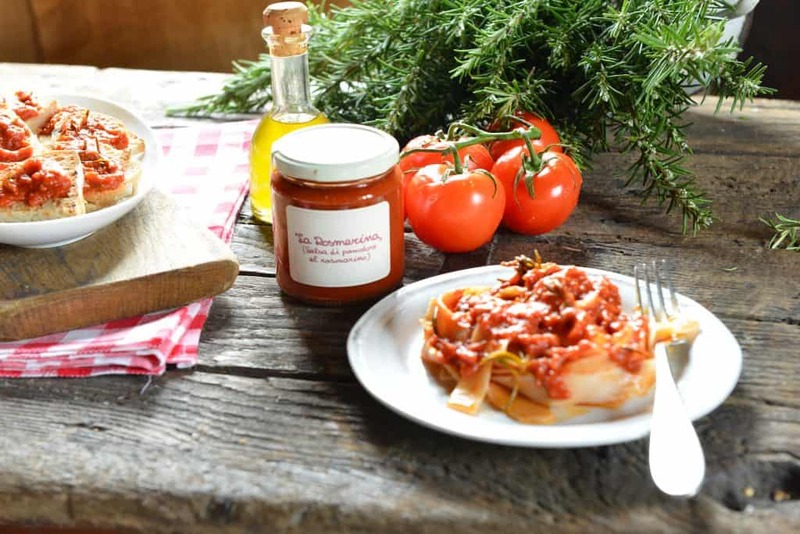 How is Rosmarina made: Tomatoes, extra-virgin olive oil, fresh rosemary, garlic, salt, hot chili peppers, and grape must are the ingredients that make up this sauce. All ingredients except the salt are derived from the farm. For those of you who wonder why there is no onion in it: when we moved to Italy we learned that it is actually very uncommon for Italian people to use garlic and onion in the same dish. We were explained, by one of our roomates, that its culturally established to say that the combo is overpowering and therefore only either garlic or onion are used to create the base of a tomato sauce. Personal opinion: As we both are real sauce fans and sometimes eat “the sauce with pasta and not pasta with sauce”, the jar of 280g was just enough for us that day. With the price of €3.90, it will remain a treat for us students. We personally had no problem with biting on a whole sprig of rosemary but if you’re not used to it, you should be aware of that. Putting the grape must in the sauce to balance out the acidity of the tomatoes, is simply another beautiful detail that La Vialla took care off and makes our “no-waste” hearts bloom. 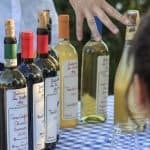 La Vialla turned out to be so much more than just a company producing biodynamic, organic, traditional Tuscan products. It became a dream come true and a role model. It was pure inspiration to see what is possible when you listen to the needs of every aspect around you. Starting with the soil, the rhythm of nature and the universe, people and the flow of our modern times.